The Carmelites of Indianapolis have called Indianapolis home for 75 years. They've lived in a monastery on Cold Spring Road doing God's work through prayer and contemplation. The nine Catholic sisters, whose median age is in the mid-70s, are moving. This summer they'll relocate to a building on the Franciscan sisters' property in Oldenburg, Indiana. Prioress Sister Jean Alice McGoff said of the decision, "It takes a lot to run a place like this. Even though we've been able to live a life of prayer, we felt it was better to make the transition when we could do it for ourselves, we have the energy and we're well." 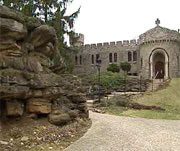 Also key is the Archdiocese of Indianapolis' offer to buy their property for a seminary. The seminary will house men preparing for the priesthood at nearby Marian College. Sister Jean Alice said,"The fact this building would continue to be a house of worship was important to us. And we just felt it was a gift of God." She and the other sisters are no strangers to change. Until the early 60s, they were cloistered, living behind the thick stone walls of the monastery, which they themselves maintained. "We were always faithful to our life of prayer, but we did a lot of work to save money," Sister Jean Alice said. "I learned to push a wheelbarrow, dig up and cut down trees, transplant trees. I learned to use all kinds of tools - hammers and saws." The sisters greeted visitors through a window with a thick screen, venturing out only for emergencies. That began to change in the mid-60s along with changes in the Catholic church. The Carmelites gradually opened up, having face-to-face interactions with visitors. They also began watching TV and reading the newspaper. While the sisters still lead simple, mostly private lives, they're well read and, well connected thru their website, praythenews.org. The sisters launched it as a way to introduce women to their way of life. "Sometimes when you set out to do a goal, something else develops and that's what happened," Sister Jean Alice said. While the website didn't result in any new vocations, it did draw worldwide attention, which was a bit overwhelming for the publicity-shy sisters. Sister Jean Alice laughed, recalling one of the media requests: "and now we were going to be on the Today Show and I just said, 'Sisters, please don't do this!'" As they do every Sunday, the sisters invited friends and visitors to join them for Easter Mass, but this time there were special prayers for the sisters. Visiting priest Father Tom Widner noted their leaving and influence on the community. "They're just warm and affectionate and very considerate of people and loving. It's a loss for the local church and Indianapolis," he said. Mary Ann Grogan, who's known the sisters for years, talked about the monastery being "a quiet space...and we like to think we take some of their goodness into our busy world." Carolyn Fay agreed. "On a personal note, these sisters are my sisters and I'll miss them very much. They've introduced me to so many ways of looking at spirituality and finding God in each other." Asked what message she wanted to share, Sister Jean Alice said, "There's a reverence in me and I think all the sisters, for every human being no matter who they are, we are all God-bearers." She said while the sisters would take down their web site after moving, they would continue to do God's work, just from a different house of prayer. Pope: Pray for Vocations and His Visit to U.S.